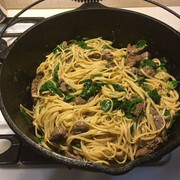 Pasta w/ steak and spinach. Yeah that's how monday dinner is done! 2. Pappardelle w/ Braised Beef, Port Wine and Gorgonzola cheese. 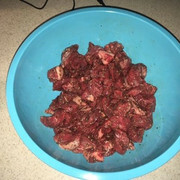 Cube up the meat and drizzle a little olive over it along with the Italian seasoning, S&P, garlic power and toss to coat. Put in fridge for a couple hours for flavor to marry. 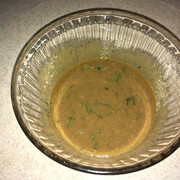 Mix the rest of the oil, Dijon mustard balsamic and 2 Tbls fresh parsley then whisk until blended. Also a grind or 2 of black pepper. This can either be refrigerated for a couple hours while the flavors marry or it can sit on the counter. If you refrigerate the sauce you'll need to pull it out about 1/2 hour before using to let it get to room temp and let oil re-liquify. About 1/2 hour before you want to eat get the heavily slated water on the stove and started. to boil the pasta. In a large heavy skillet (cast iron is my preferred weapon of choice) preheat over med/hi heat for a few minutes. Drizzle in a little olive oil in the preheated skillet and brown the meats. Work in batches if you need too do not crown the skillet. Once meats are done dump in dressing, stir, cover and set aside. While the noodles are cooking rough chop the spinach and the remaining 2 Tbls of parsley. Cook pasta and drain (reserve 1 or 2 ladle full of the pasta water). After pasta is cooked put back into pot with, pasta water, and stir until water is absorbed. Then add dressing/meat, spinach and parsley to the pasta and over low heat heat for a minute or 2 to get everything warm. Serve topped with crumbled feta cheese. Here's the meat cubed and seasoned and the dressing all mixed up and everything getting to know one another for few hours. Re: Pasta w/ steak and spinach. Yeah that's how monday dinner is done! .........well you'll just have do #2 as well. how else can we compare?